Sheesh - I've been away from this blog a bit, since it's looks like one of my more recent posts was about the last time we were at Troy Night Out. HoTRD will be at Troy Night Out tonight. 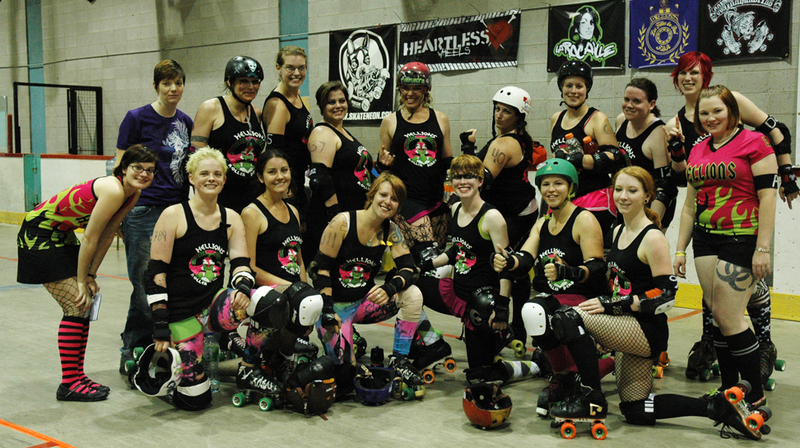 I hear there could be some ticket giveaways for our next home bout on Saturday, August 6! 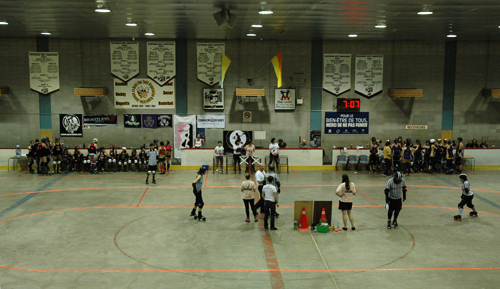 Saturday, June 11 we took on on one of Montreal Roller Derby's home teams, Les Filles du Roi. This means "the Kings Daughters" in French. After a delightful Friday night and Saturday afternoon in Montreal, we were incredibly pumped for some international roller derby action. 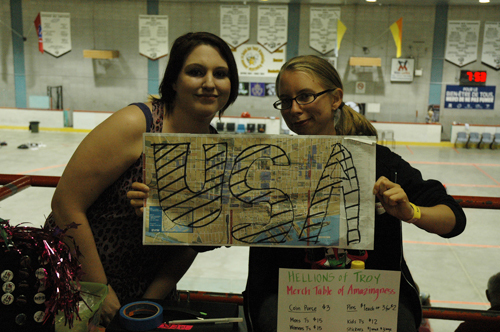 First of all, Montreal Roller Derby was EXTREMELY friendly, accommodating, and welcoming from the get go. Our volunteers were comped, they had our merch table ready to go, and they hooked us up in the locker room. 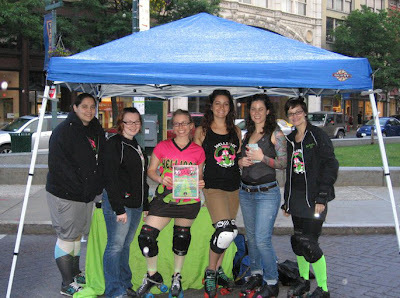 I wasn't playing on this roster, so I worked the merch table to Escargot (she rocks). Short Temper and Escargot: Team Merch. This was not a bad deal, because from our post, we had an amazing view of the track. Hellions! Mathundra Storm likes out her war cry! The game started off great - and was closer than we expected. If I recall correctly, the Hellions were in the lead for the first 10 minutes, and it was a close game the rest of the period until Montreal ended up with a solid power jam. 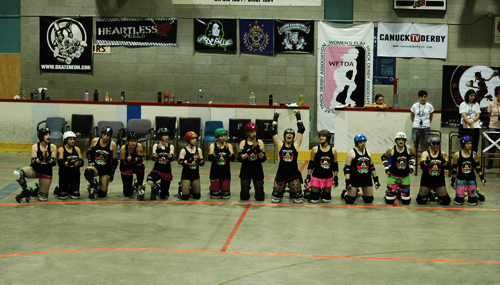 At the end of the first period the score was 42 Hellions - 73 Montreal. Before the start of the second half, Knockout Kid got a special birthday serenade from Montreal's announcer Plastik Patrik. Patrik and Miss Ida did a fine job announcing during the bout - Patrik in French and Ida in English. This was a really exciting game to watch, especially when the Hellions began to close the gap in the second period. 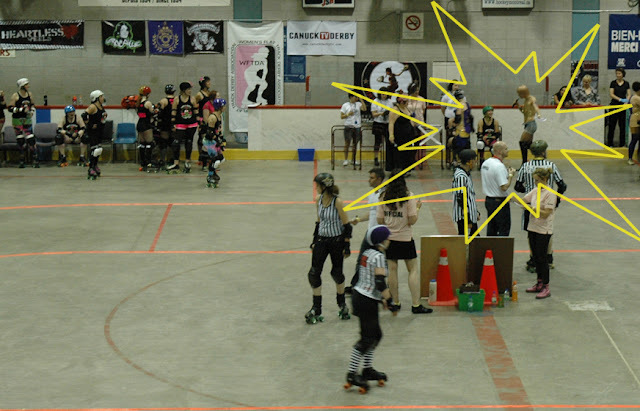 In the end, we had a bit of trouble staying out of the penalty box, and with Montreal holding strong, we ended the bout with a score of 134 Montreal - 112 Hellions. 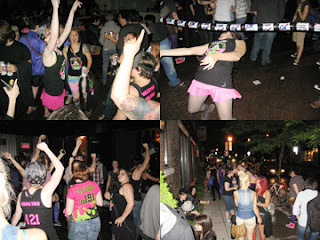 Then of course we headed to the after party, where Montreal showed up an amazing time. Seriously, if your league has the resources (we're lucky enough with our location being just 3.5 hours south) to get up to Montreal to play this team on their home turf, you need to make the trip. The Hellions had a wonderful time in the city, at the bout, and hanging with these fun-lovin' derby girls. Thanks Montreal! Oh one more thing - catch the video archive of the bout here on Derby News Network!